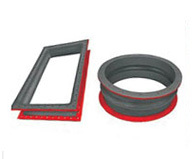 Rubber Flue Duct Expansion Joints are custom designed based on specific applications in industrial ducting systems. Due to the variety of process conditions, such as hot air and gases, many materials are available. From low to high temperature, and wide chemical concentrations.